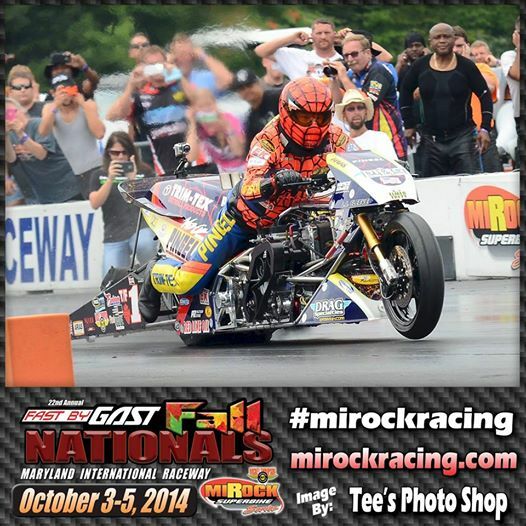 The Mickey Thompson Tires MIROCK Superbike Series heads to Maryland International Raceway for the last MIROCK event of the year in Maryland, at the 22nd annual Fast by Gast Fall Nationals on October 3-5, 2014. 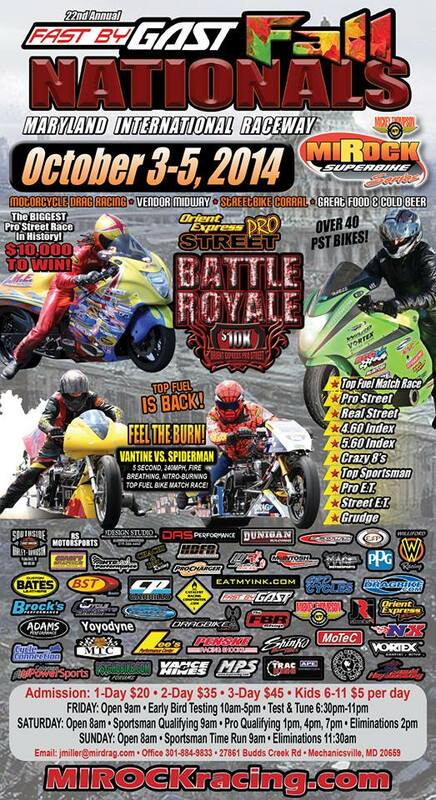 This event will feature the Orient Express Pro Street Battle Royale with a total purse of $22,000! 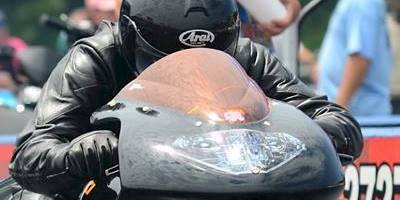 This class will draw in the largest field of Pro Street bikes ever competing for a huge cash purse of $10,000 to win, and paying the Top 50 riders! There will also a “B” class, “C” class, and a “D” class for Pro Street racers that do not qualify for the Top 16. This class will draw in over 40+ Pro Street racers from all over the country and abroad. Do not miss this spectacular class and witness records fall in this epic Pro Street event. The event will also feature a special 5-second, 240mph Top Fuel match race with Larry “Spiderman” McBride taking on Dave Vantine! The event also will include DME Racing Real Street, Trac King Clutches Top Sportsman, Cycle Connection Crazy 8’s, Louis Concrete 4.60 Index, FBR Shop 5.60 Index, Fast by Gast Pro E.T., and Brock’s Performance Street E.T. 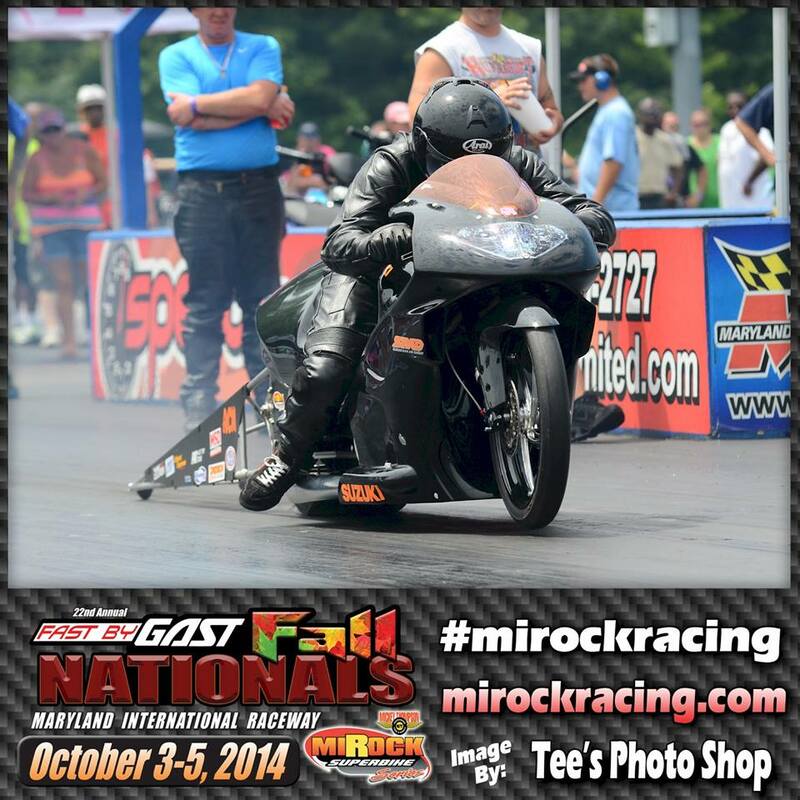 As always there will be a ton of ET motorcycle drag racers at this event. Grudge Bikes will be run behind the pros like normal on Saturday and Sunday, however the normal 2-Hour Afterdark Underground program on Saturday Night will not be run at the FBG Fall Nationals due to the 700+ bikes at this event. We will however run a “Bonus No Charge Grudge Session” on Saturday Night after E.T. Eliminations are completed, and each grudge racer will get one additional run at no charge. Again, this change is only due to the extremely high bike count at this event. The event will also host a vendor midway full of motorcycle parts, apparel, and accessories! There will also be a special Bikers For Babies fundraiser and a group ride held during this event. 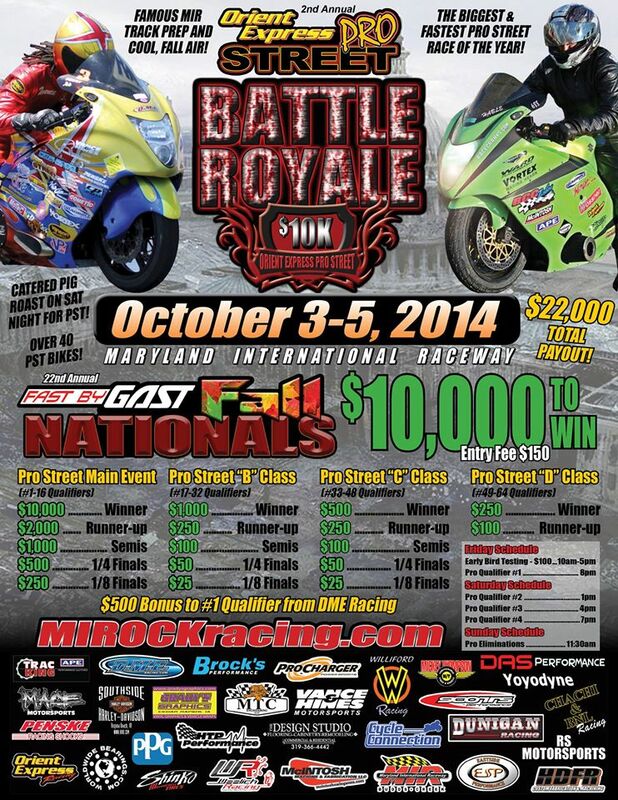 So head to Maryland International Raceway for an exciting weekend of motorcycle action!